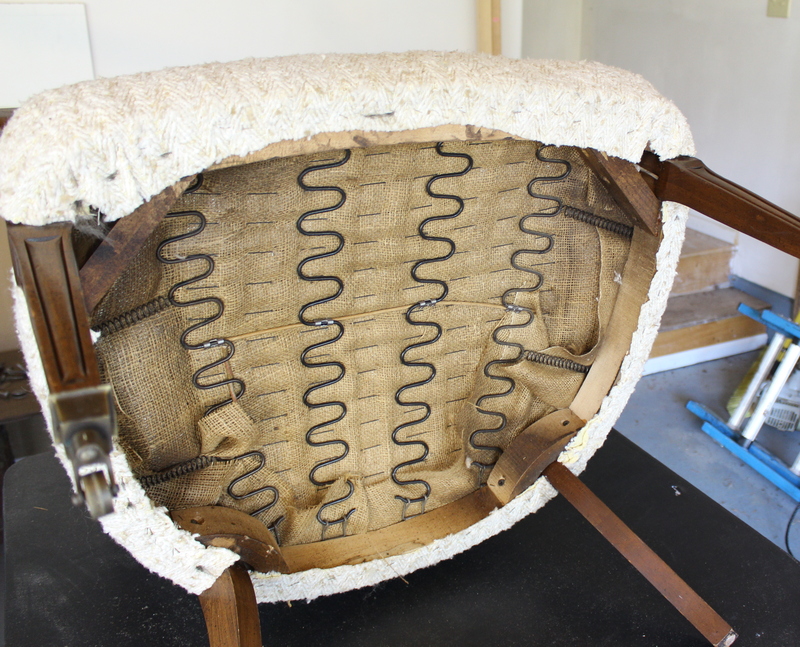 Last year I picked up 2 caned club chairs off of craig’s list to hone my re-upholstery skills . I immediately fell in love with their barrel backs and caned arms. Turns out it was pretty fortunate that they had neutral fabric since they have managed to sit in our house for quite some time! I couldn’t come up with a plan of action, until now! My goal is to post each week step by step until it’s complete! Hopefully this will keep me accountable! We’ll see! Start at the bottom removing the dust cover. That’s where the staples are exposed and it’s the easiest place to start. 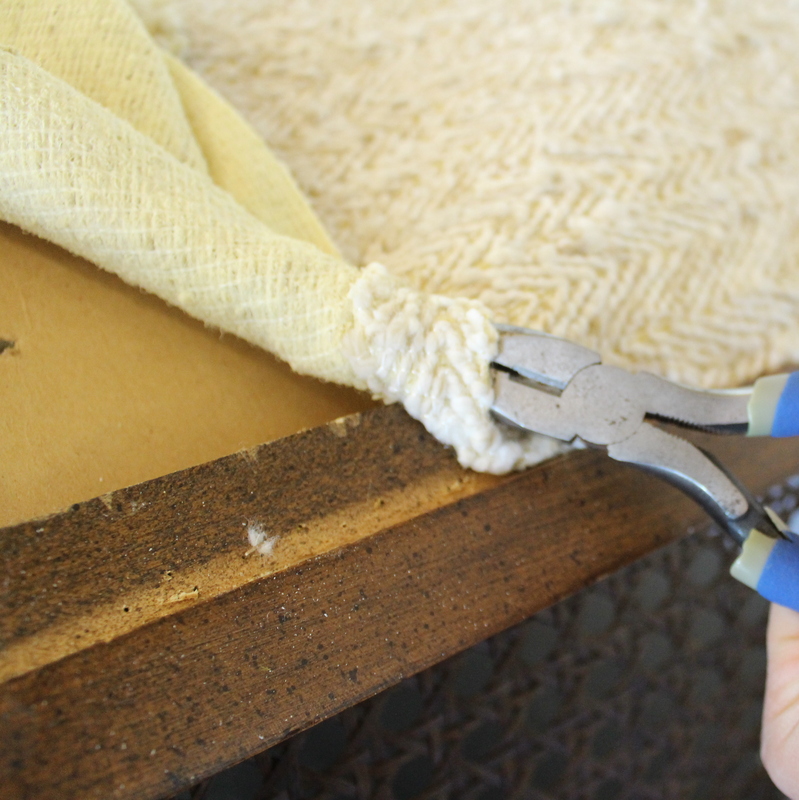 I use a pair of needle nose pliers and snips, working my way around the chair prying out the staples. 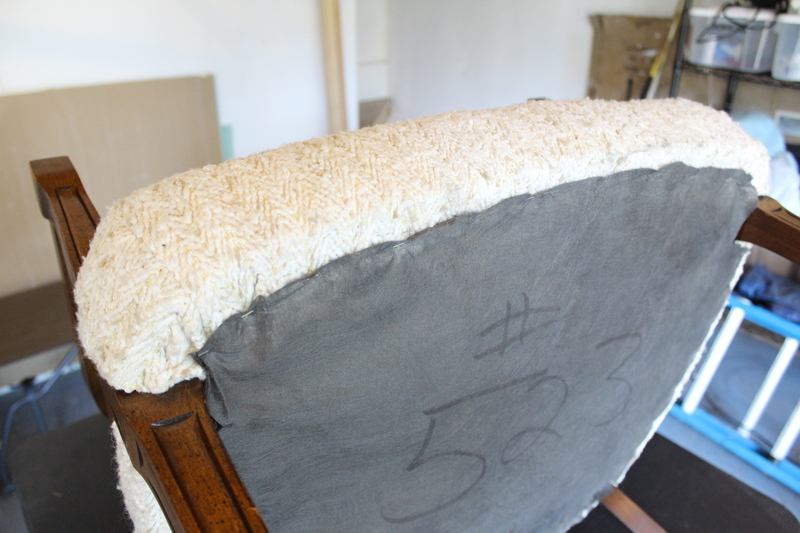 Once the dust cover is off do the same with the seat fabric. 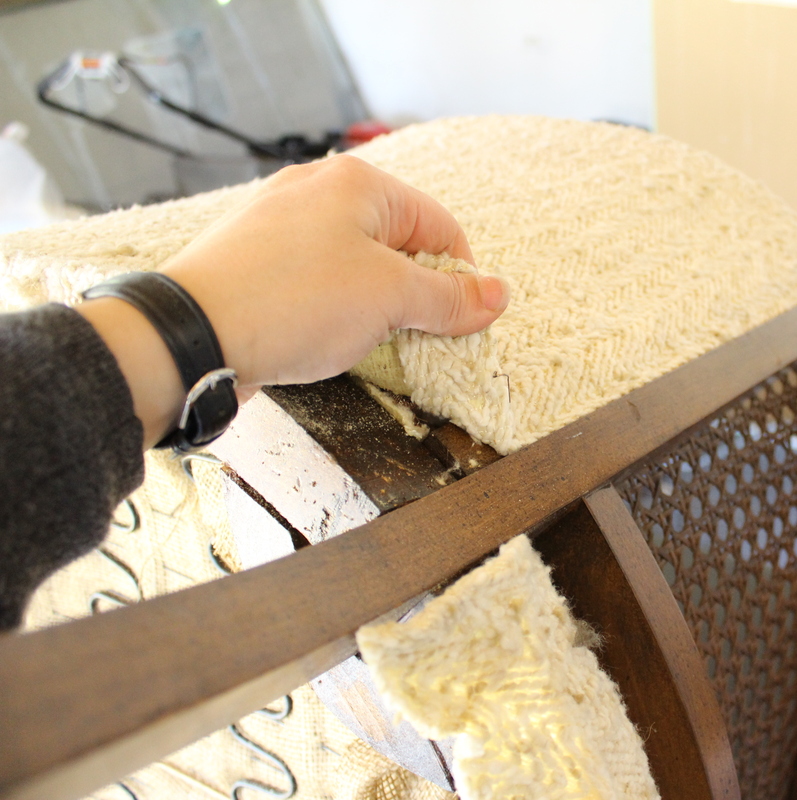 The fabric on the seat of these chairs wrapped up around the legs/arms, so I used a little extra caution not to scratch the wood. You might be able to tell from this picture that the staples are slightly visible. 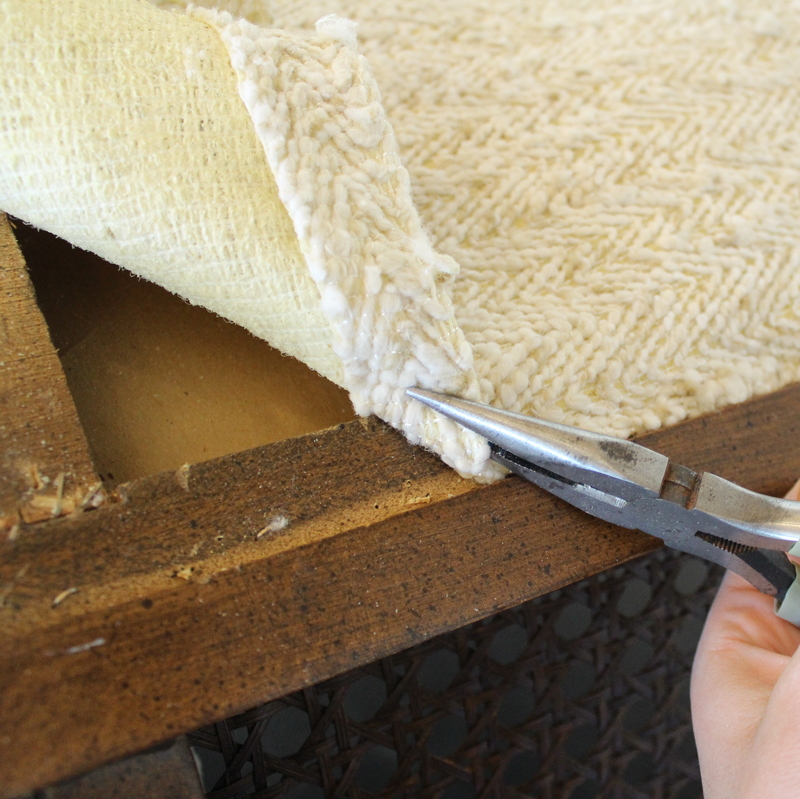 The fabric is so thick and textured that it camouflages them. 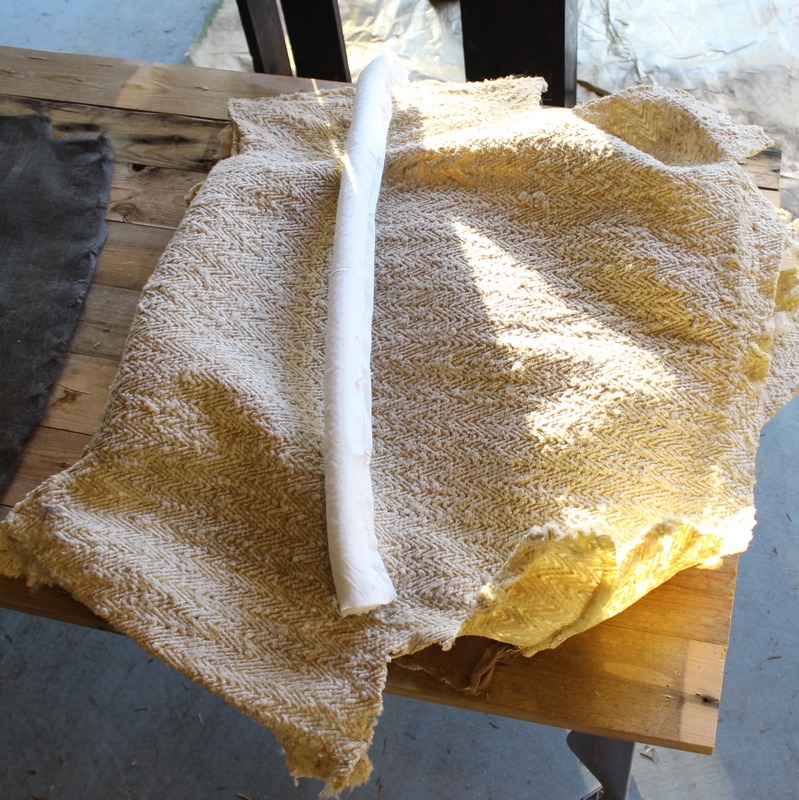 The new fabric that I picked won’t work like that, so I will be using cording around the legs to hide the staples. 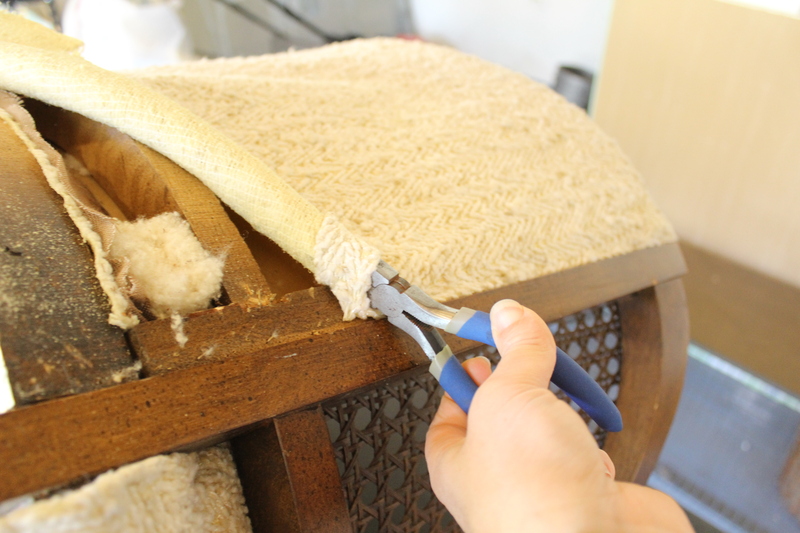 Once all the bottom staples are pulled, start on the back of the chair. 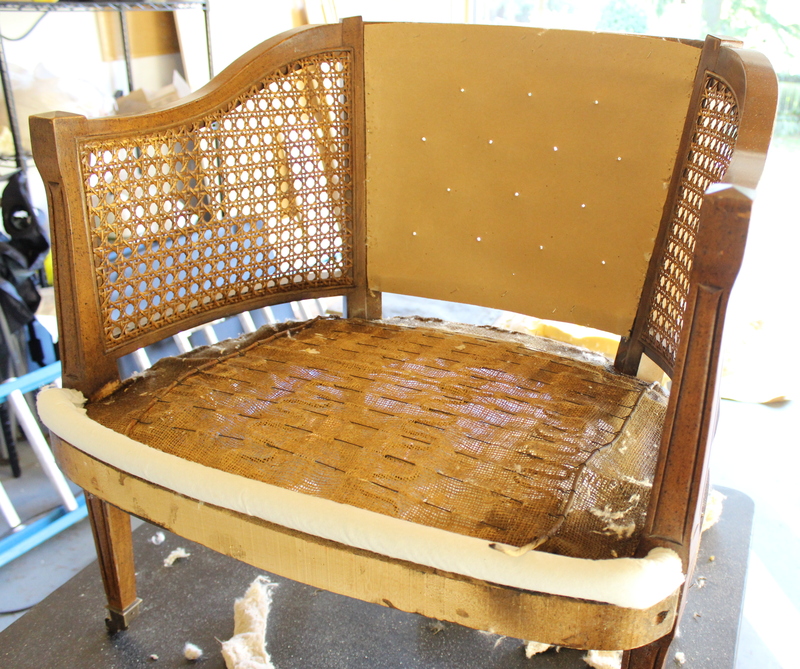 I started by working my way up the sides of the chair back from bottom to top and then over to the front of the chair. I find it easiest to pry out the first few staples then get the fabric with the pliers, and then rotate the pliers in my hand. It takes out about 3-4 staples with each rotation, then I just re clamp with the piers and repeat. It’s definitely faster then pulling each staple out individually. 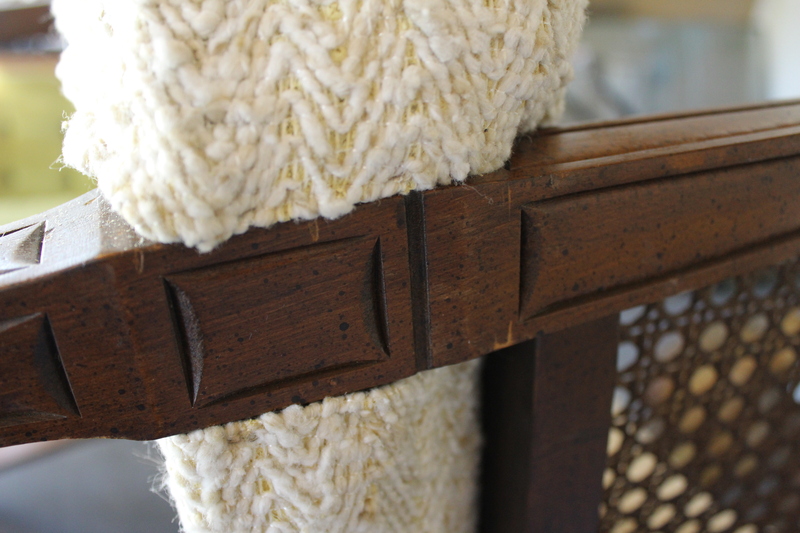 Like the chair legs, the staples were visible along the sides of the front back cushion, so again I used extra caution not to damage the wood. 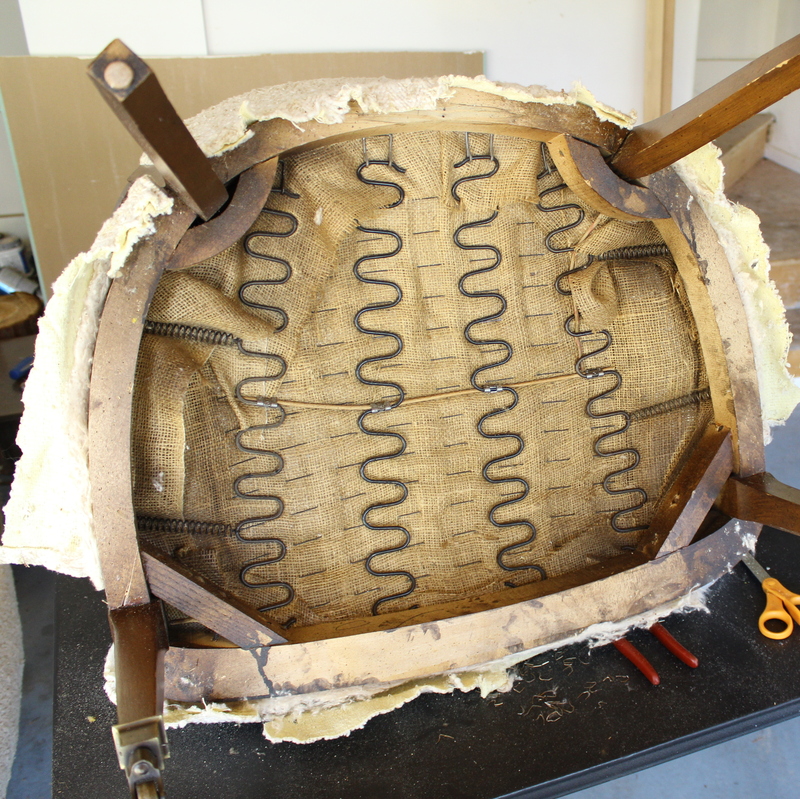 From the looks of the back cushion, this wasn’t the first time the chair was upholstered. Somewhere in a previous life the chair was tufted with 14 back buttons and 31 seat buttons. That’ intense! I’m opting not to tuft this chair. 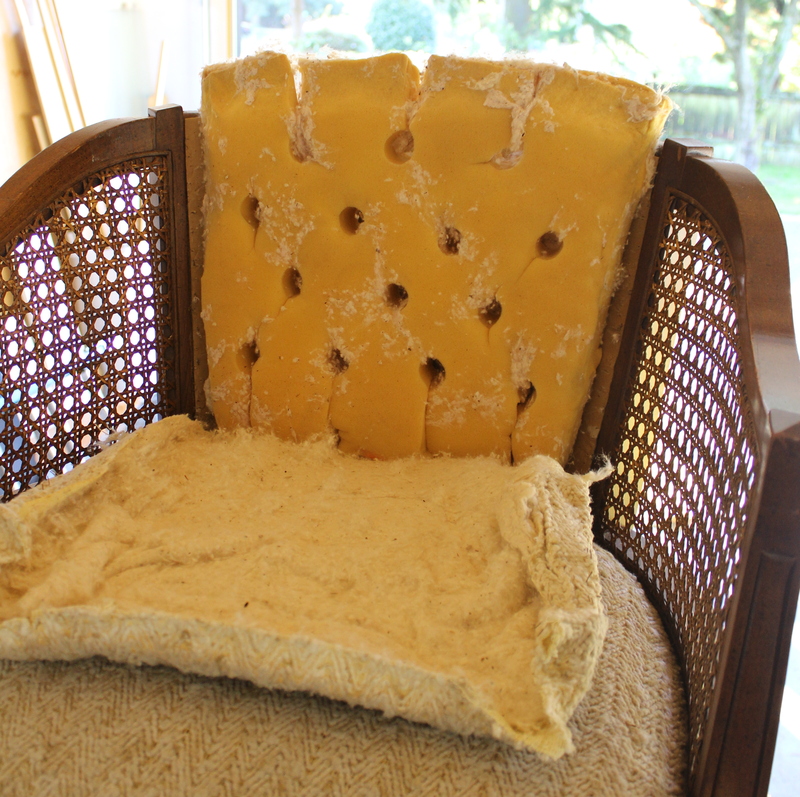 Under the back cushion was a piece of cardboard for a little extra support. That was removed since it’s relatively cheap and easy to replace. Take care as you rip off the fabric. A lot of times it is very handy to hold on to them as patterns to cut the new fabric, not only for size, but also for having to sew darts. 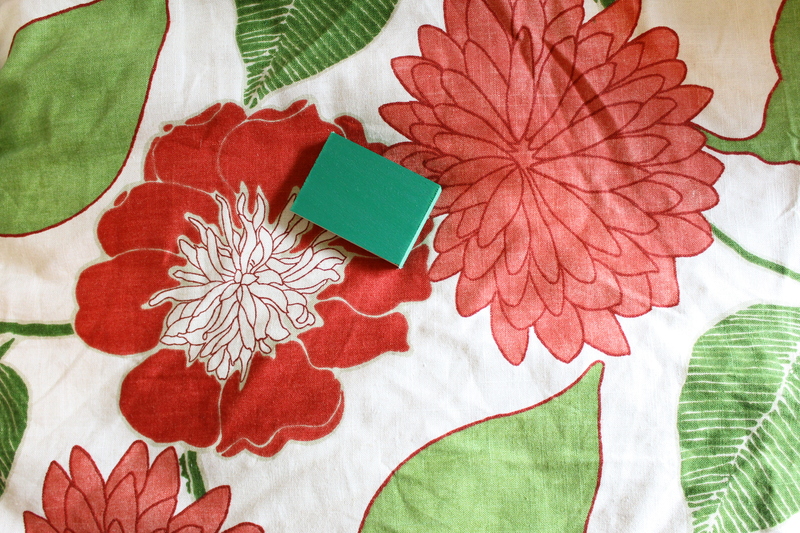 I chose my fabric and wood color. The fabric is Richloom Emily’s Garden, hence the name of my chairs. 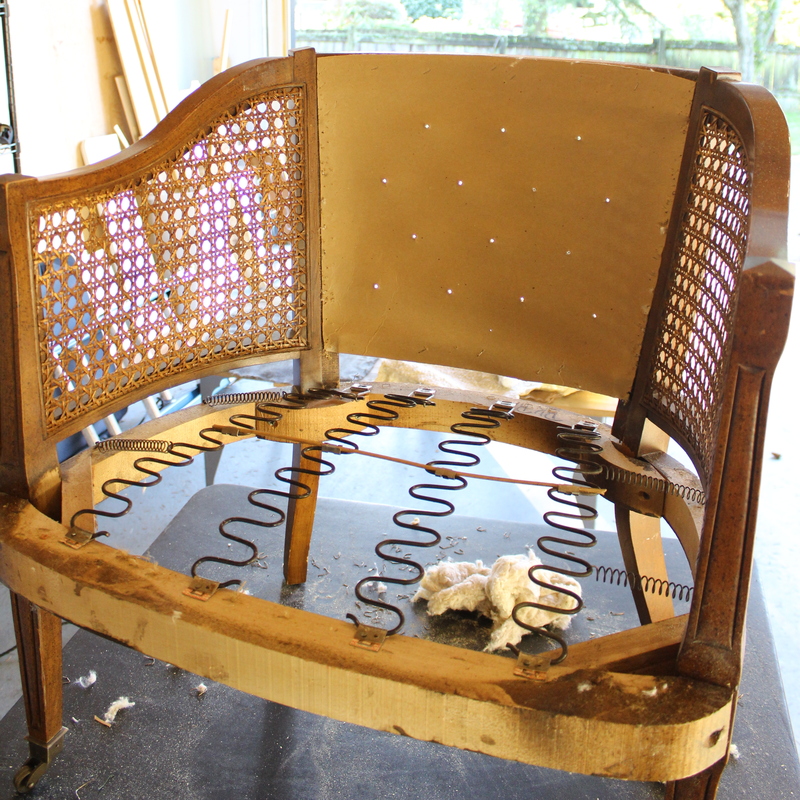 And for the chair frame I am going with Krylon’s Meadow Green. 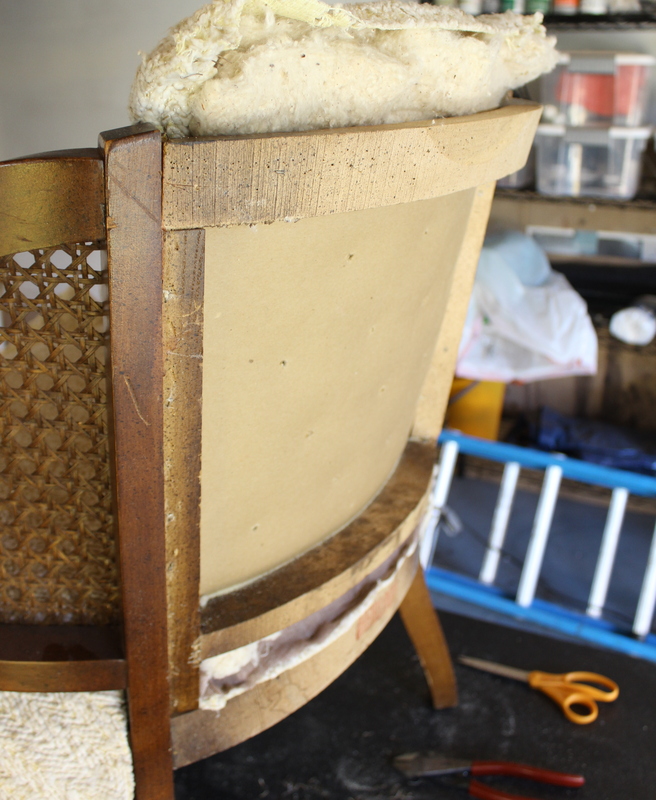 I really can’t wait to get these chairs finished! 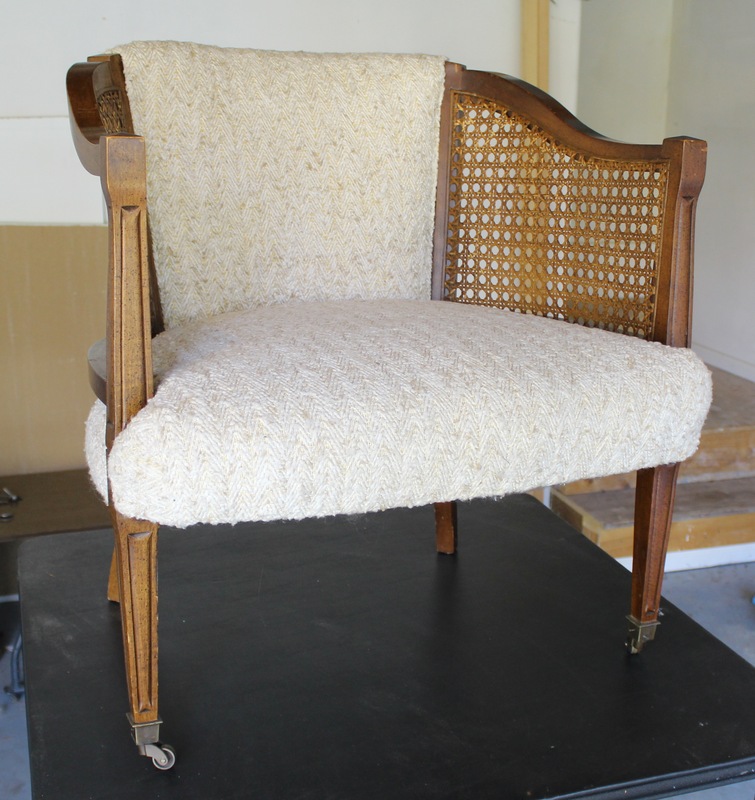 This next week I will be working on sanding the chairs down and repainting them. Check back next week for their updated status! And Wednesday I will be posting my pinterest challenge project, so definitely check in for that as well!